Well that was a blast at City of Ale and a big thanks to Norwich pubs who have played their part in creating ever stronger links between their city and Rouen, and laid plans for a spectacular sea journey next year to recreate the transport of Normandy stone which built Norwich’s Normandy Cathedral and Castle – only this time the cargo will be French beer. During the City of Ale festival our collaboration brew with Normandy brewer Northmaen, appropriately called Amitie – French for friendship – went down so well, but did you know it was only because I was fortuitously mistaken for a French rock star that it ever came about. You see I knew that Norwich has not only been twinned with Rouen since 1959 but the two cities had historic ties linked by the wool trade since the time of the Vikings, and so planned to brew a beer to celebrate the connection and was fascinated to find Northmaen, a small brewery based on a farm close to Rouen. So, I duly sent an email to Northmaen and was delighted to receive an immediate response thanks to a misunderstanding. I’ll let Dominique Camus, founder of Northmaen, explain the confusion. Hallyday, known as the French Elvis, died last December. Thousands attended his funeral in Paris and over a long career he had become a French rock legend. While I most definitely don’t perform rock music, but I did find that the two breweries have a good deal in common and the beer was born, using a combination of French and Norfolk barley as well as French hops. 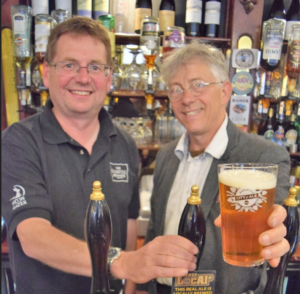 Over 3,000 pints were brewed and enjoyed in over 30 pubs, while Norwich welcomed a contingent from the French brewery. The twinning of the two cities celebrates its 60th anniversary next year and so rather than brewing the beer ion Norfolk as we did this year will travel to Normandy, brew the beer and load up the boat to sail across. The Northmaen guys celebrate their Viking links each year at a large Norfest festival and will don their Viking costumes for the journey, so the site of a Vikings arriving in the heart of Norwich laden with beer will raise a few eyebrows. However, the spectacle also has a serious note as it will aim to involve a new generation in the twinning of two cities and to establish new friendships. The ‘Amitie’ boat will arrive on 23rd May 2019 – so be warned the Vikings are coming!